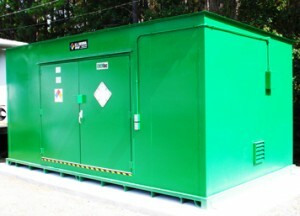 Non Flammable chemical storage is designated for chemicals that do not require fire-rated construction. As with any chemical storage, there are other hazards that must be mitigated, and Non Flammable chemical storage buildings are designed to protect your chemical inventory while safeguarding your personnel from hazmat situations. Non Flammable chemical storage has benefits that can aid you and your facility in many ways. Seeking Non Flammable chemical storage solutions from U.S. Chemical Storage grants even more benefits. U.S. Chemical Storage offers Non Flammable chemical storage solutions that can improve safety and productivity in your workplace. Whether your chemicals are corrosive, toxic, or hazardous to the environment, our Non Flammable chemical storage buildings are designed and built to lessen the dangers and prepare you for any hazardous situations that may occur. Our buildings come with a 15 year structural warranty, so we’re positive our Non Flammable chemical storage buildings are exceptionally durable, standing up to the test of time. In the event of a chemical leak or spill, the leaked chemicals will be held by a secondary containment sump. Hazardous materials will be prevented from entering the environment and you’re able to properly and safely clean and dispose of the chemical. Our sales team and engineers are prepared to help you achieve compliance by designing and constructing a chemical storage building according to your needs and specifications. We exceed government regulation by bringing you the highest-quality product in the chemical storage industry, so you can rest assured that your Non Flammable chemical storage is safe and protected. Our buildings are hand-welded from heavy-gauge steel and offer superior protection against extreme weather conditions. We have long delivered quality products for safety in Flammable and Non Flammable chemical storage, and will continue to do so in the years to come.